"I'm in love with my brother," my sister told me. "That's forbidden," I told her, "It wouldn't be in harmony with the world." She became sad and I had to cheer her up with her favorite foods and a new outfit. Then she was back to normal, but we went through the same episode the next day. Where had my life gone so wrong? I started playing a Japanese game for my DS called Tomodatchi Collection (Friend Collection in English). In the game you have an apartment building and you can make Miis (or send them from your Wii) to live in it. Once there, you can give them food, clothing, and interiors and they can make friends, fight, or fall in love with other Miis. It's the obvious sim extension of Miis. In fact, I was disappointed when I found out that Wii Miis had only appearances and no personality, and now this disappointment has finally abated. The first Mii you make is yourself (so you are both a Mii and a huge god-hand), encouraging you to make Miis of people you know in real life. So I made Miis of my husband, my family, my in-laws, and some friends. This was a big mistake. I thought I told the game that these were my siblings, but apparently that can't get in the way of love! I was lucky enough for my husband to fall in love and successfully woo me (In the park, pridefully finally won me over [you can choose how they confess! ]), but not all of my Miis ended with their intended pairs. It's uncanny when the game gets personalities right (like when I found out that my husband's daisuki food was sukiyaki, or when my Mii got excited about wearing a suit), but since tastes are randomly generated, they're more often way off. Sometimes I can make the Mii look like the real person, but it breaks the likeness spell when my friend hates the cute gothic dress I got her or it turns out that my brother hates bread. That complaint aside, it is a really cute sim game and has helped me practice my Japanese (if you've studied Japanese for about a year, you'll be able to get around in this game. Heck, you could probably figure it out not knowing any Japanese, it just wouldn't be as hilarious). I'm still finding out new things about the game a month later--like that I can hypnotize a Mii if I have a special item and make them dream about something. And speaking of dreams... Mii dreams are awesome. Sometimes it's something as usual as falling or being unable to find a bathroom, but surreal dreams where you're helping your Mii jump from one parrot stand to the other just add the perfect zaniness to the game. I love this game to pieces, and I think I can tell why it's been one of the top ten DS games in Japan. Sim games aren't for everyone, but if they are for you, you will probably also love this game. Imagine you're in some crime show, like Bones or Monk. Now, instead of watching and saying afterwards, "I knew it all along," you must actually prove your ability to predict the solution to crazy murder mysteries. That's Ace Attorney: Miles Edgeworth. Gameplay is limited to investigation (finding evidence and linking information with "logic") and interaction with witness/suspect testimony. 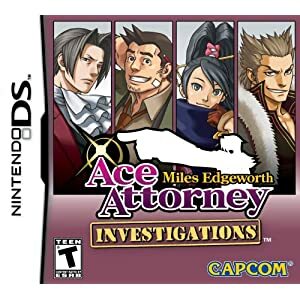 Superficial reactions: I've never played any of the other Ace Attorney games, but this one had a satisfying intertwining of initially disparate "chapters" of play. The script and character animations are fairly hilarious, though the distinctive music for each situation/character gets old by the end. Most of the time the obstacle is not figuring out what happened but figuring out how to tell the game that. For example, in order to use a piece of evidence that contradicts the witness's testimony, you must present it at exactly the right part of his testimony. It's remarkable that it works as well as it does, but it's frustrating when it's not as intuitive, as "dying" consists of replaying everything since your last save (booo-ring). Controls: You can point and click with the stylus, but you can actually play the entire game without ever using the stylus. It's difficult to decide which is more desirable; buttons are more game-feeling but less precise when you want to point to that part of the screen, but using the stylus for a long time feels kind of weird. Oh, and you can use the "B" button to fast-forward through some text you've already seen. Recommendations: I enjoyed the game more when I started playing in 30-60 minutes chunks. If like me, you play for 5-10 minutes and then pick it up again in a week, it's going to be frustrating to remember what's going on (although the game does provide useful hints as you flounder). Cultural context: There is a lot of Japanese legal system culture that comes out in this game. The bizarre obsession with "truth," evidence, and the 100% confession rate are all a part of it. This NYTimes article sheds some light on the bad reputation Ace Attorney's prosecutors have. It claims that "Japanese authorities have long relied on confessions to take suspects to court, instead of building cases based on solid evidence," which also explains Ace Attorney's obsession with evidence, to the extent of absurdity in some situations. The Japanese courts do not allow plea bargaining, which explains the odd confession rate. Go read the article, and these games will make so much more sense.